Dem Memo Says ‘Dreamers’ Are Key To The Future, Will POTUS Deliver New Democrat Voter Block Via Amnesty? Dem Memo Says ‘Dreamers’ Are Key To The Future, Will POTUS Deliver New Democrat Voter Block Via Amnesty? Dem Memo Says ‘Dreamers’ Are Key To The Future, Will POTUS Deliver New Democrat Voter Block Via Amnesty? Even as liberal reporters continue to babble about the fake anti-Trump book coursing through the media, Donald Trump held a public meeting with a group of congress-critters to talk about immigration policy. The meeting had conservatives worrying that Trump was leaning towards amnesty and their worries weren’t assuaged any after a memo was leaked showing Democrats planning on giving amnesty to illegals in order to create permanent new Democrat voters. 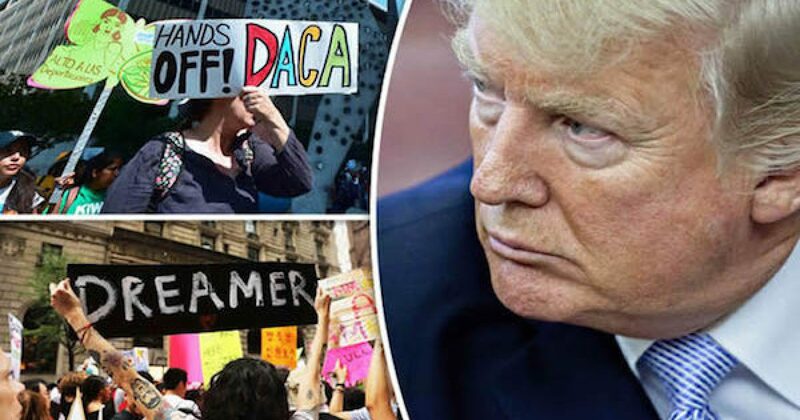 The leaked memo from the far left-wing Center For American Progress (CAP) Action Fund noted that called the so-called “Dreamers” are a “critical component of the Democratic Party’s future electoral success,” Daily Caller reported. In other words, the left feels that amnesty for law-breaking illegals will eventually give them an unbreakable lock on winning elections in the near future. But it will require Congress to make the move to give the Democrats a new, unshakable voting block. The memo calls getting amnesty a “moral imperative” for the Democrats to get their new voting block. The Democrats also have a plan to get Congress to pass amnesty. They plan to hold the federal budget hostage until weak spun Republicans buckle and give it all up. Unfortunately, Trump’s Tuesday meeting on immigration policy tends to elicit fears that the president is foolishly going to give the Democrats everything they want. Worse, according to White House Press Secretary Sarah Huckabee Sanders, the White House has negotiated an agreement on DACA, Obama’s Deferred Action for Childhood Arrivals policy. “This should be a bill of love, truly. It should be a bill of love, and we can do that,” Trump said on Tuesday, according to Breitbart News. “I really do believe Democrat and Republican, the people sitting in this room, really want to get something done,” Trump said, adding that it would be a “bill of love” for illegals. This “bill of love” rhetoric is awfully familiar to conservatives. The phrase is eerily similar to the comments made by Jeb Bush back in 2014 when he was gearing up his campaign for the GOP nomination for president. In April of that year, Bush called an amnesty policy an “act of love” for illegals. Trump’s sudden echoing of Bush’s hoary rhetoric is quite interesting since Trump ridiculed Jeb for his “love” comments. It seems pretty obvious that Trump thinks that giving up some sort of concession on DACA to the Democrats in exchange for their approval of his border wall will be a win-win. But if that is what Trump is thinking and his concessions end up tarring him with the amnesty brush, he will surely find that his assumptions will lead him to disaster. Trump should already be well warned over advocating for amnesty. It was the main reason two high profile Republicans had their chances for higher office dashed. For one, Jeb’s “act of love” comments and his drive for amnesty pretty much sunk his chances for winning the GOP nomination for president. The same fate befell Florida Senator Marco Rubio who was hailed as the next coming of Ronald Reagan until he joined the Senate’s Gang of Eight and began seeking a “solution” to the immigration problem. Rubio was sunk by an avalanche of accusations that he was advocating for amnesty. Whether Rubio was or wasn’t advocating for amnesty — and he always maintained he wasn’t — Rubio’s was tainted in the eyes of Republican voters, and his bid for the GOP nomination was sunk by voters furious at him for his amnesty plans. Let’s hope Trump remembers these lessons. But if he doesn’t we already have some people warning Trump that he better start remembering. President Trump has his warning. Let’s see if he listens.